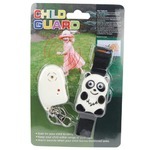 CHILD GUARD PANDA - Have you ever experienced the terror of thinking your child is missing or lost? We have all had the gut-wrenching feeling of turning around on a busy street and finding that our child is nowhere in sight. Now this could be prevented with the new improved CHILD GUARD PANDA. Worn by the child, the cartoon animal-shaped transmitter sends a constant signal to the receiver, which is held by the adult. The signal is adjustable - from a distance of 3 to 21 feet, so when the child goes beyond the set distance, the adult’s receiver starts to beep, letting them know that the child is starting to wander off. The Child Guard is worn on the child’s wrist. The Nap Zapper is a simple device that could just save your life- or help you keep your job! The small, flexible device rests comfortably over the top of your ear and will sound an alarm to wake you if you start to doze and your head nods. Perfect for sleepy drivers or someone working the late shift and is having trouble staying awake. It works great for security guards, machine operators, and even students struggling to stay awake while studying. The DoorJammer is a new unique portable door security device for anyone needing privacy and security. It is an ideal solution for people traveling, working, or at home. The DoorJammer is a simple way to prevent unwanted intrusions into any room and provide peace of mind. Important: as you can see in the pictures there needs to be a small space (about 1/8") below the door for the base of the DoorJammer to slide under. This space is normally found under interior doors but not under all exterior doors. The horizontal force being exerted on the door from the outside is converted into a vertical force to anchor the DoorJammer firmly into the ground. Not only does this prevent the door from moving horizontally, it also forces the door upward, increasing the DoorJammer's grip and reducing the chances of its foot slipping on the floor. In case of an emergency, the DoorJammer can quickly be removed from beneath the door. Simply pull it the upward and it will release from it's locked position. • Designed for Strength: the horizontal force being exerted on the door from the outside is converted into a vertical force to anchor the DoorJammer firmly into the ground. • Works on all doors with at least 1/8" gap below the door: it can be fitted to most doors in seconds. Attempted forced entry will 'jam' the door shut and provide both security and privacy. • Works on all Floors: the rubber coated footpad allows the DoorJammer to be installed on any type of surface: hardwood floor, carpet, tile, linoleum, etc. 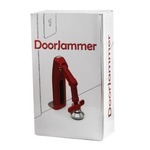 • Easily Removed in case of emergency: the DoorJammer can be easily pulled-off the door; simply pull the DoorJammer upward and it will remove itself from its locked position enabling you to escape the room quickly in case of an emergency. 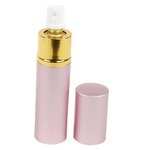 • Compact and lightweight making it great for travel: with a weight of only 8 oz and size of 4 3/4" high and 2 3/4" wide the DoorJammer makes the perfect travel companion. Easily slips inside your purse, suitcase, or backpack. Protect yourself from the inevitable Zombie attack. 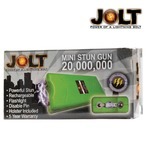 No one should be without a Jolt 20 Million Zombie Attack Protection (ZAP) Stun Gun. Zombies don’t fear guns or grenades- those can’t stop them- but they do fear the ZAP! If it works on Zombies just imagine what it’ll do to a real person! 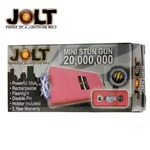 Triple stun technology: Most stun guns on the market today have only one or two points of contact. When using this model to defend yourself, the Triple Stun Technology (TST) allows the electrical charge to emanate between three separate points on the metal probes at the top of the stun gun, making for a louder and more intimidating sound. Even when test fired the loud, bright electrical burst is often enough to stop an attacker; and if not, a jolt from this Jolt certainly will! 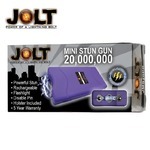 Metal disable pin: Prevents an attacker from taking this stun gun away and using it on you. A strap worn around the wrist attaches to a disable pin on the bottom of the unit. If the stun gun is taken from you, the pin will pull out, preventing it from working. Unlike other models this pin is made of metal. Built-In Charger: The slide-out plug on this unit allows for easy charging. There are no cords to keep up with; simply plug into a standard wall outlet. Bright LED Flashlight: The LED flashlight provides a convenient source of light whenever you need it and eliminates the need to carry a heavy, bulky flashlight. 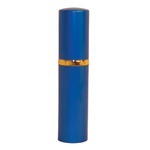 Designed for women, this powerful pepper formula is contained inside a common looking lipstick that houses a powerful self protection OC pepper delivery system. 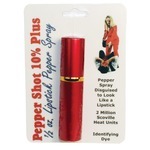 The Lipstick Pepper Spray is a convenient and subtle way to carry the protection you need into any environment in which you might find yourself. Contains 5 one second bursts and sprays up to 6 feet. 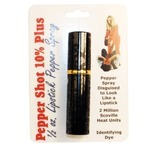 Made by Pepper Shot, a proven and popular brand of pepper sprays. Many of our dealers sell chemical deterrent sprays in States other than where their principal place of business is located. We get questions everyday as to which states are legal and which states have restrictive laws regarding sale, possession, and use of tear gas and/or pepper based deterrent sprays. In an attempt to ascertain what each state law are in regards to the use and sale of these products letters were mailed to each of the State Attorney Generals. The letters asked for copies of the current State laws covering chemical aerosol sprays used for self-defense. The following summary of our research reflects what the various laws are on the sale and use of non-lethal spray weapons. In no way should this be regarded as the final word on the legal status of said laws. This report is not intended to take place of legal counsel nor should it be looked at as being any form of legal advice. Please check with your local authorities to obtain the latest information, as our politicians and bureaucrats have a tendency to change laws from one day to the next. Get one for yourself and for a friend! Available in five classy colors.